Manchester City Council’s Executive has formally adopted the new target, which has been proposed by the city’s Climate Change Board, in line with research carried out by the world-renowned Tyndall Centre for Climate Change. Recommendations produced by the Tyndall Centre, based at the University of Manchester, include a set of actions and a proposed definition of ‘zero carbon’. Under the plan, Manchester will adopt a science-based ‘carbon budget’, capping total emissions at 15 million tonnes from 2018 – 2100. The city will also commit to a 13 per cent year-on-year reduction in emissions from 2018 onwards - becoming zero carbon by 2038, well in advance of the previous commitment to achieve this goal by 2050. The report, which follows recent international reports stressing the importance of making rapid reductions in global carbon emissions, outlines that all of the city’s sectors will need to greatly reduce their carbon emissions, if the target is to be met. It highlights the council’s leadership role, in working with businesses and housing providers to help them to become more energy-efficient and with Transport for Greater Manchester to encourage further uptake of public transport, cycling and walking, by investing in new infrastructure. With the new target endorsed by the council’s Executive, the Manchester Climate Change Board will now develop a draft action plan by March 2019, ahead of producing a final plan by 2020, detailing how the city can stay within its carbon budget. 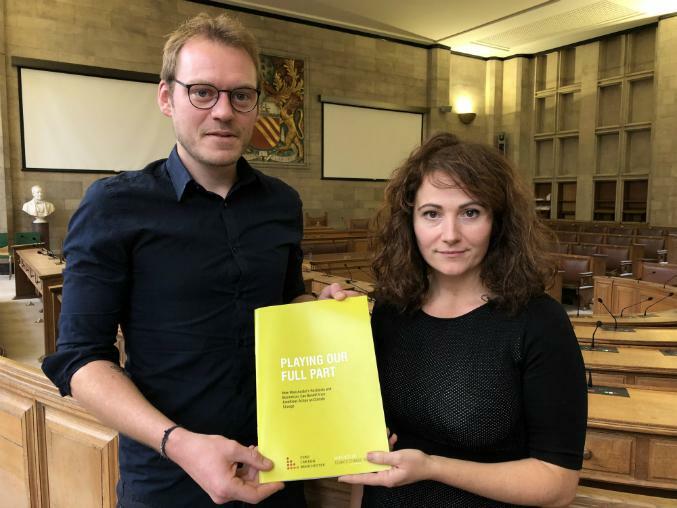 Executive Member for the Environment, Planning and Transport, Councillor Angeliki Stogia, said: “The new target for Manchester to be a zero carbon city by 2038 is challenging, but it is clear that going further is necessary if we are to play our full part in limiting the future impacts of climate change. “A zero carbon city will have many benefits for our citizens, not least enhanced air quality, better public transport networks, lower energy bills and future job opportunities in the growing low-carbon energy sector. Gavin Elliott, Chair of the Manchester Climate Change Board, said: "As Chair of the Manchester Climate Change Board, I applaud Manchester’s leaders for talking this bold step to commit to reducing Manchester’s Carbon emissions in line with the science based targets set out in the Paris Climate Agreement. This places Manchester at the very forefront of world cities leading on this issue, and creates a massive opportunity to transform the city both environmentally, socially and economically. We’re very proud of the role the Climate Change Agency has played in helping the city to arrive at this point, and look forward to working with all stakeholders across the city to help them grasp this incredible opportunity, to the benefit of both our and future generations." Lord Deben, former Environment Secretary and Chair of the Committee on Climate Change, said:"This gives me real hope. How typical of Manchester to step forward and lead in this way. Making changes is never easy but cleaning up the local economy will really help people in Manchester and could become a blueprint for other cities around the world. My Committee is here to help, as am I." Lucy Powell MP for Manchester Central, said: "This is a big move by the council and I welcome it. Manchester was the world’s first industrial city – it’s part of our heritage, part of our fabric – but too many people locally are still affected by the loss of industrial jobs, by energy bills that are too high, and by air pollution. This commitment has the potential to help people affected by these problems now, and it will help us become a truly modern city. The details are vital and I’ll do all I can to make sure everyone I represent can have their say." Claire Perry, Minister for Energy and Clean Growth, said: “The case for tackling climate change is more stark than ever before, but it’s not just for government to tackle alone – communities and businesses also need to play their part. “That is why we’re working with local leaders and businesses who know their areas and its unique strengths best to develop tailored Local Industrial Strategies to drive growth across the UK while accelerating action to reduce greenhouse gas emissions.